Nylon: Handling 4000PSI and available in several grades with various fillers and performance enhancers, nylon is probably our most used bearing material. Nylon can be used in very large or small bushings, since nylon is available in cast or extruded forms. The extruded nylon can be made into very small bushings and larger bushings can be cast to net size and machined to completion. Tuffkast: Nylon has drawbacks: water absorption, cold weather performance and impact. Tuffkast is a co-polymer that can provide the bearing properties of nylon with the impact resistance of polyurethane. The only reason it isn’t used more is that it’s still earning name recognition. Polyurethane: Polyurethane is available in Redco 750 and 750 SXL bearing grades. The nice thing about urethane is if you need a mass-produced bushing because we can supply a precision-molded product, machining them to finish if necessary. Polyurethane has great impact resistance and can handle loads up to 2500PSI. Phenolic/Composites: Composite bushings allow for the highest loads a plastic bushing can take. They perform extremely well high-load, low RPM applications. A benefit of composite bushings is that the material (or a liner on the inner diameter) is designed to create a lubricating film on the shaft, meaning no greasing in some applications. Some of these bearings can be purchased (though are not stocked) in finished sizes common throughout various industries. Turnaround time for finished bushings varies, but is usually a few weeks. We can always supply just the bearing grade material to you in almost all cases to improve delivery or reduce costs if you want to machine them yourself. If interested in a finished bushing or bearing, unless you know exactly what you’re looking for, the first step is to complete our bearing design worksheet, available by clicking these links for a simple sleeve bushing or a flanged bushing. That can be emailed to sales@redwoodplastics.com and will be reviewed by the appropriate contact for quotation. For more information on our bushing and bearing solutions, visit our website’s dedicated page here. UHMW-PE can serve as an excellent low-load bushing, 500-800 PSI is at the top of its limitations. UHMW has the benefit of being economical, self-lubricating and readily available. Customers tend to be very familiar with this particular plastic and trust it. Areas for concern with UHMW are its relative low-load, and high thermal expansion. Cast nylon (nylon 6) is a widely used bushing material and can handle up to 4,000 PSI. Cast nylon is available in several grades including heat stabilized, Moly-filled and oil-filled. The primary area of concern with nylon is its moisture saturation: 4% in a water saturated environment. Impact and cold environments are also a concern for nylon. Nylon bushings can either be made with much more generous allowances in aqueous environments, or acetal may be a substitute. Acetal is one of, if not, the best plastic to machine due to its hardness and ability to machine to tight tolerances. Acetal is often a good substitute for nylon in marine environments. Often just called “Micarta” or “phenolic” by customers, industrial laminates excel in high-load, low RPM applications. Certain industrial laminate bearings can handle in excess of 24,000 PSI. You do need to be aware that these bushings should be lubricated and that certain rotational speeds will not work. If you need to know the specifics, just ask. 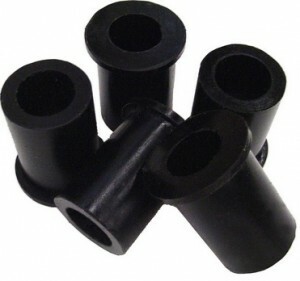 Polyurethane bushings are often an excellent choice. They handle abrasion, impact, and can be molded (perhaps with some machining to finish them). Polyurethane can handle up to 2,500 psi. Cold temperatures may be a concern, and tooling costs are often involved with urethane parts, but the end result are effective bushings that can be produced with low-lead times and in quantity. For answers to your questions on our bushing or bearing material, contact us today.